The Cyclist's Training Bible is the bestselling and most comprehensive guide for aspiring and experienced cyclists. Joe Friel is the most trusted coach in the world and his proven cycling training program has helped hundreds of thousands find success in the sport. Joe has completely rewritten this new 5th Edition of The Cyclist's Training Bible to incorporate new training principles and help athletes train smarter than ever. The Cyclist's Training Bible equips cyclists of all abilities with every detail they must consider when planning a season, lining up a week of workouts, or preparing for race day. The Cyclist's Training Bible is the world's most trusted guide to cycling training. Get stronger, smarter, and faster with this newest version of the bible of the sport. 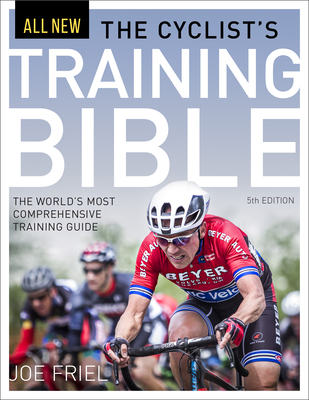 What's New in this fifth edition of The Cyclist's Training Bible? Coach Joe Friel started writing the fifth edition of The Cyclist's Training Bible with a blank page: the entire book is new. This new edition adds emphasis to personalizing training plans, incorporates new power meter techniques, improves on ways to develop technique, updates the strength training approach, speeds recovery for busy athletes, and cuts through the noisy volume of training data to focus athletes on the numbers that mean the most to better performance. Joe Friel is the most trusted endurance sports coach in the world. He is the best-selling author of The Triathlete's Training Bible, The Cyclist's Training Bible, Fast After 50, Going Long, Your Best Triathlon, The Power Meter Handbook, and Your First Triathlon. His TrainingBible Coaching service is one of the most successful and respected in endurance sports.Joe has trained endurance athletes since 1980, including national champions, world championship contenders, and Olympic athletes in triathlon, duathlon, road cycling, and mountain biking.He is an elite-certified USA Triathlon and USA Cycling coach and holds a master's degree in exercise science. He conducts training and racing seminars around the world and provides consulting services for corporations in the fitness industry. He has also been active in business as the founder of Ultrafit, an association of coaching businesses; TrainingPeaks, a web-based software company; and TrainingBible Coaching.